The IoT market is growing at an exponential rate, enticing companies to produce new innovations that will capitalize on this hot trend. However, technologists are often so focused on building the most advanced capabilities that they overlook the usability and user experience, having to clear these hurdles once the product is developed. While state-of- the-art products also drive UX developments, the current wave Voice-based products are a good example, theses product success depends solely on whether they are of value to the end user and are also user-friendly. Does the product simplify, automate, or enhance consumers’ lives? And, does the consumer need an engineering degree to use it? The dream of IoT is to automate and simplify our lives. Therefore, IoT products should integrate seamlessly into our world and require as little user management as possible. Reducing the friction between people and their technology, will open the door to mass consumer adoption of useful IoT products. 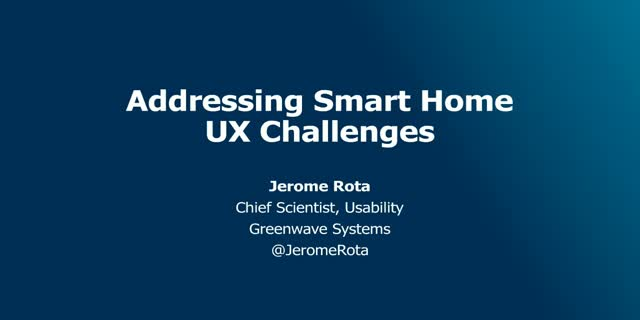 As the Chief Scientist of Usability at Greenwave Systems, Jerome Rota will provide expert UX/UI insights and share his perspective on the best UX mix to achieve one's objective.